Hotel Liceo completes the acommodation offer of Madanis group with 24 rooms where guests can enjoy the comfort and atmosphere characteristic of Madanis, at very affordable prices. Madanis Liceo Hotel is part of the new trend in hotels 'low cost ', which aims to offer customers the same features as high range accommodation. 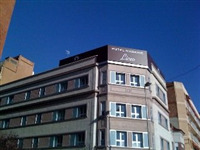 Liceo Hotel is located in a building carefully refurbished and equipped with all the comforts that modern technology provides. It also has three 'business points' with computers connected to internet, coffee and drinks and TV. On the rooftop solarium is installed, which is available to customers free of charge, just like the free WiFi is available throughout the hotel. The reception is open 24 hours in hotel Madanis, which is about 50 meters away. Breakfast is also offered at the hotel Madanis.